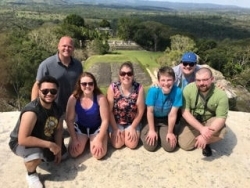 Matthew Deyoung, a university professor from Grace Christian University, moves his family to Belize and creates the most unique learning experience for students of all ages. The business focuses on cultural intelligence and business retreats. Grand Rapids, MI, April 18, 2018 --(PR.com)-- Matthew DeYoung has been a college professor for the last six years. Last year, he saw the need for a new way to teach cultural intelligence and with the help and support of Grace Bible College he created BluDot Global, an organization committed to teaching cultural intelligence. De Young explains: "I think this trip says a lot about how special Grace Bible College is; Very few colleges or universities would have allowed me the freedom to follow this dream and build something this unique." When he approached Grace Bible College about moving to Belize and developing a trip that helped students develop their cultural intelligence they were amazingly supportive of the idea. Dr. Scott Shaw of Grace Bible College says that the college supports him. Dr. Shaw went on the first trip. He explained, "It was really a special experience that will allow students to have a really unique, life-changing experience." Abigail Bickler a senior from Grace Bible College just returned from the trip and explained, "There has never been a college course that has changed my perspective and taught me so much. Matt has been my professor for the last 4 years. He has been a my business professor in several classes. Before he came to Grace we did not even offer a degree. Today I know that God called me to business and after taking his courses I know that I am prepared to be an incredible employee for any organization I get a chance to work for." Professor DeYoung is also fulfilling his passion of creating jobs in developing nations. "I was a missionary in Africa with Grace Ministries International. They are an incredible organization, they taught me everything I know about the way respectful mission work needs to be done. When we lived in Africa my entire focus was about business as a mission and giving people jobs so there would be less orphans and more opportunity for people." For the last 6 years Matt has been working for as the president and CEO of a franchise organization called Shine. They built their entire business around the Bible verse Matthew 5:16. Matt explains, "I got to watch men and women change their lives by starting a business, I got a chance to coach people through the process. I became more confident that I could coach business people in any size business." When Matt left Shine for Belize it was because he needed to take care of his family. They are adjusting to a new life after God healed his daughter after a 6 year battle with cancer, and because he knew that God had put a leadership team in place at Shine that was so devoted and incredible, it was time to use his talents elsewhere.